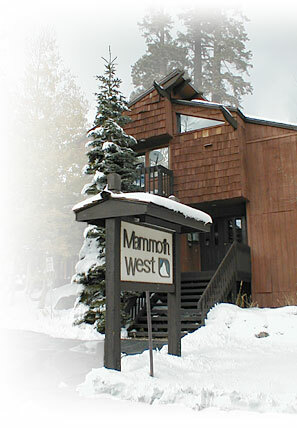 Mammoth Condos and Vacation Rentals at Mammoth Mountain! Mammoth West has Mammoth Lakes vacation rentals conveniently located at the base of Mammoth Mountain's Canyon Lodge, just steps to the lifts and slopes. Mammoth West's location next to the slopes is one of the best in Mammoth Lakes, the ultimate in convenience and Mammoth condo rental charm! Mammoth West Condos features very tastefully decorated and very spacious two, three and four bedroom Mammoth vacation rental condos. All condos have private entrances and balconies, offering unusual privacy and size, the perfect Mammoth lodging choice for family vacations. Mammoth West Condos has beautifully landscaped grounds among tall pine and aspen trees and a large year-round jacuzzi and sauna. The swimming pool is open in the summer, when you can enjoy the fabulous fishing, hiking, boating, water-skiing, golfing, horseback riding, summer concerts, mountain biking on Mammoth's Bike Park, relaxing next to alpine lakes, enjoying the flora and fauna, and much, much more. Ask us about deals on Mammoth condos and last minute specials on your next Mammoth vacation rental! Winter Economizer - Stay More, Play More, Save More! Winter Economizer specials let you stay more and save more at Mammoth West this Winter. Book 4 nights arriving Sunday or Monday and get the first two nights free...avoid the weekend crowds and book the best midweek deal in Mammoth. The best weekly deals on Mammoth vacation rentals, available for last minute bookings. Check out all of our promotions at Mammoth Sierra Reservations for more information! MammothWest.com is owned and operated by Mammoth Sierra Reservations, and is in no way affiliated with Mammoth West Homeowners Association.